Whereas the stereotypical pro-government voter consumes partisan local media; by contrast, the stereotypical protester in Bucharest owns an iPhone and reads international newspapers online. Over the weekend of 10-12 August 2018, Romanian and international media were filled with images of government violence against peaceful protesters. Roughly 120,000 people filled Victory Square in Bucharest on Friday (10 August), demanding that the ruling Social Democratic Party (PSD) step down following the dismissal of a senior prosecutor, Laura Codruţa Kövesi, who has been investigating corruption charges against politicians. Romanians were also protesting against the introduction of new laws aimed at subordinating the judiciary to party politics. Despite the overwhelmingly peaceful nature of the protests, police and gendarmes used tear gas to disperse the crowds from 4pm on Friday onwards. By 11pm, they received orders to clear the square. They did so using tear gas, water cannons, pepper spray, and by beating protestors with batons. This was one of the largest and most violent repressions the country has seen since 1990. Videos and images of police violence continue to circulate on social media, and demonstrators are demanding that the government respect European norms about the right to peaceful assembly and personal security. Anti-PSD rallies took place throughout Bucharest from late 2016 onwards, but escalated and became centred upon Victory Square during January 2017, when the newly-elected PSD government passed a series of laws pardoning certain crimes while amending the criminal code. The major beneficiaries of the laws were Liviu Dragnea, the leader of PSD, who was convicted with a suspended sentence on charges of fraud and abuse of office; and Dan Voiculescu, a media mogul and billionaire in prison for money laundering. A large number of PSD politicians fell victim to politically-targeted anti-corruption campaigns during the presidency of Traian Băsescu (2004-2014), and these laws were an attempt to allow party leaders to remain in politics. Despite large-scale street protests, the prime minister passed the laws by “emergency decree” ignoring public debate and the opposition. 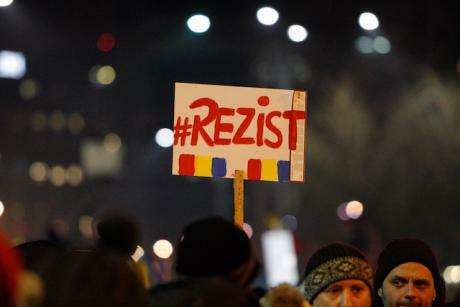 Mobilizing around the hashtag #rezist, by early February 2017 over 500,000 people across the country had taken to the streets in various cities to protest what they regarded as an abuse of power. They were supported, ineffectually, by President Klaus Iohannis and by leaders of the major opposition parties, as well as by sympathetic rallies in capital cities around the world. Protests have been held regularly in Bucharest’s Victory Square since they began, but the government has to date shown no sign of backing down. The street protests reveal significant divisions within Romanian society, between those who value the norms of liberal democracy and those who are more comfortable about “breaking the rules” when they believe it is in the country’s best interests. After a 40% voter turnout and significant attempts to mobilize voters living abroad, PSD won the 2016 elections with a comfortable majority. Pervasive social stereotypes assume that PSD voters are pensioners, housewives, the unemployed and the poorly educated, but sociological analyses of the elections suggest that the party is now able to attract the support of large numbers of people with tertiary educations. PSD voters are frequently state employees or members of the lower middle class in contemporary Romania. Voters appear to have been well aware that leading politicians have been involved in high levels of corruption. Nevertheless, they chose to vote PSD in anger over cuts to pensions and state salaries introduced as austerity measures by a series of liberal governments, overseen by then-President Traian Băsescu following the 2008 financial crisis. Moreover, they view imprisoned PSD politicians such as Liviu Dragnea as victims of a cynical attempt by Băsescu to eliminate his political rivals through corruption trials. The majority of protesters appear to be highly-educated professionals aged between 18 and 35, with firm views about the rule of law. Whereas the stereotypical PSD voter runs Windows XP and consumes partisan local media; by contrast, the stereotypical protester in Bucharest owns an iPhone and reads international newspapers online. The fact that their party won the 2016 elections with a comfortable majority means that PSD voters often see the protestors as “poor losers” – privileged individuals used to having their own way in national elections, and who cannot accept that their preferred candidates are not in power. PSD voters often see the protestors as “poor losers” – privileged individuals used to having their own way in national elections, and who cannot accept that their preferred candidates are not in power. Beyond the immediate issue of the legislative changes, protesters are angry at a political culture dominated by a corrupt plutocracy and by individuals with connections to the Communist-era secret police, the Securitate. As is typical of street protests in a post-Occupy world, they have consistently failed to support any leader or party, nor have they made specific demands – apart from asking that the government reinstitute anti-corruption laws before stepping down. Lack of institutional support makes the longevity of these protests surprising, and the fact that they have continued unabated for twenty months is a testament to the anger that protesters feel towards the government. During this time, protesters have used social media in innovative ways, with public debates over the issues being broadcast via social media, as well as activists using Facebook and Twitter to share information and coordinate activities. Despite the large numbers of workers living abroad and incidents of hooliganism incited by small numbers of people, the repertoires used by the crowds on 10 August were substantially similar to those that have sustained the #rezist movement for the past twenty months. Yet this was the first time the authorities have used water cannons, pepper spray, and tear gas against protesters. Preliminary reports suggest that gendarmes acted on direct orders from their superiors. It is still unclear why, after twenty months of protests, the government felt that this level of force was necessary. It is unlikely that they felt that state security was threatened by the protests, even if this was the message that media outlets promoted in the days leading up to 10 August. Street protesters are the only thing preventing the government from undermining the country’s liberal democracy. With no significant opposition either from the president or from opposition parties, street protesters are the only thing preventing the government from undermining the country’s liberal democracy. The repression may be a sign that the government sees the subordination of the judiciary to be the culmination of their political program over the past year and a half and decided to marginalize debate over the proposed legislation by shifting the focus to questions of law and order. Protests have continued in Bucharest in recent days, and have spread to other major urban centres. The association of protest with the diaspora has waned, however, and increasingly protesters are the same people who have sustained the movement since January 2017. Regardless of whether the protesters manage to achieve their aims, the unprecedented number of people involved in these protests has enshrined social movements as a key element of Romanian politics, which is something that is unlikely to disappear any time soon. Dr Roland Clark is a Senior Fellow at CARR and Lecturer in History at the University of Liverpool. See his profile here. © Roland Clark. Views expressed on this website are individual contributors and do not necessarily reflect that of the Centre for Analysis of the Radical Right (CARR). We are pleased to share previously unpublished materials with the community under creative commons license 4.0 (Attribution-NoDerivatives).